During peace talks, success often depends on the leverage possessed by each party. The Taliban’s growing control has increased their leverage and authority to negotiate a peace agreement. Agreements mediated with credibility leverage last twice as long as those without. Capability leverage is most effective to facilitate the signing of peace agreements. Credibility leverage is most effective at generating durable and longer-lasting peace after the agreement is signed. 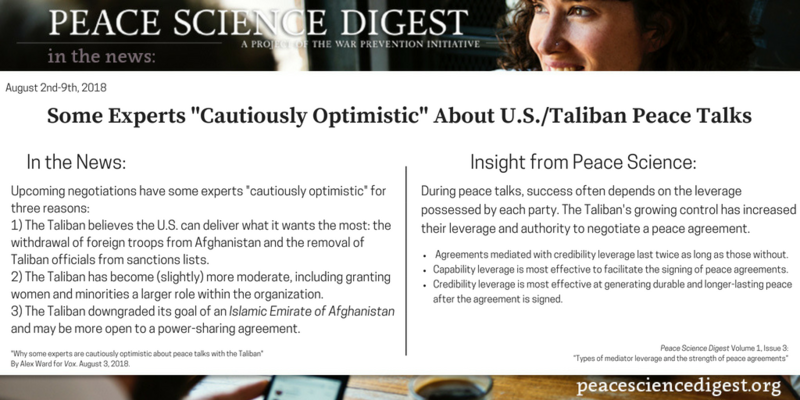 “Why some experts are cautiously optimistic about peace talks with the Taliban” By Alex Ward for Vox. August 3, 2018. Next article Has Social Media Made It Too Easy To Organize Mass Protests?